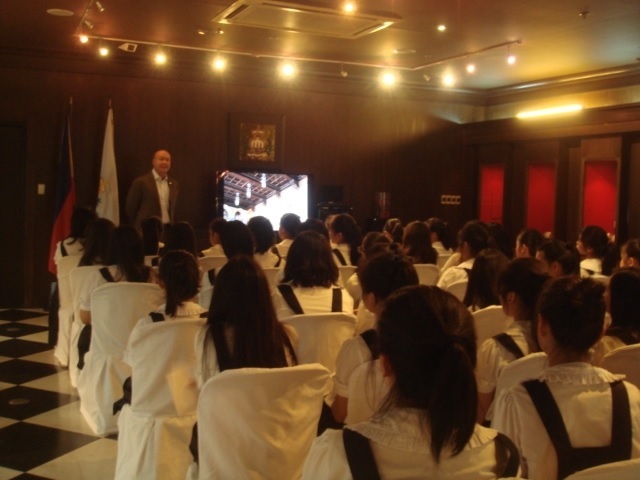 Students from St. Scholastica’s Academy Manila visited the Office of the Honorary Consul General of the Republic of San Marino in the Philippines on September 4 for a cultural awareness event. Forty-four members of the Kamalayang Pilipino Club of the said school’s High School Department, together with their adviser Rosario Decipulo, exposed themselves to the culture and history of the enclave-state. “The students were very eager in learning and curious about San Marino,” said Leonor Elepano, secretary to Consul General Jean Henri Lhuillier and was one of the organizers of the event. With a commitment to finding alternative ways of learning, St. Scholastica’s Academy considered the cultural immersion as a major student activity this year. To make the experience even more exciting for the girls, the host organized a San Marino-themed, word-guessing game, which followed the format of the hit variety show segment Pinoy Henyo. The event concluded with a discussion of the Consul General himself with the students of the key issues about the relationship between San Marino and the Philippines.